I love roasting a chicken. 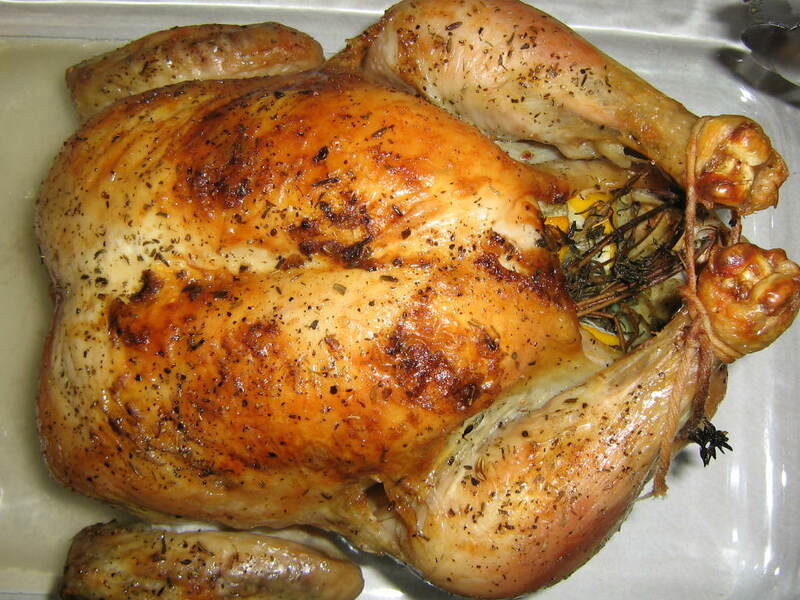 When I was little, I loved when my mom would roast a chicken, because it reminded me of Thanksgiving. We all know the power that food has over us, how we associate a meal or recipe with a happy memory. I get memories of family, of togetherness, of vacation, everytime I roast a chicken. I keep that tradition alive year-round by inviting a friend over for dinner when I make my own roast chicken. It’s a perfect dinner for company, because you don’t need to spend much time in the kitchen once the bird is in the oven. This is the dinner I look forward to each fall, when the temperatures drop, and I’m excited to turn on the oven. And though it’s still only July, we’ve had unseasonably cool temperatures, so roasted chicken is just as delicious as ever. Remove the chicken from the refrigerator 30-45 minutes prior to begin bringing the bird to room temperature. Remove the chicken giblets. Liberally salt and pepper the inside of the chicken. Stuff the cavity with the bunch of thyme, both halves of lemon, and all the garlic. Brush the outside of the chicken with the butter and sprinkle again with salt and pepper. Tie the legs together with kitchen string and tuck the wing tips under the body of the chicken. Place the onions, carrots, and potatoes in a roasting pan. Toss with salt, pepper, several sprigs of thyme, and olive oil. Spread around the bottom of the roasting pan and place the chicken on top. Roast the chicken for 60-75 minutes, or until the juices run clear when you cut between a leg and thigh. Remove the chicken and vegetables to a platter and cover with aluminum foil. Remove the fat from the bottom of the roasting pan, reserving 2 tablespoons. Add the chicken stock to the pan and cook over high heat on the stovetop until reduced, about 5 minutes. Combine the reserved chicken fat with the flour and add to the pan. Boil to cook the flour and thicken the sauce. Strain the gravy into a small saucepan and season to taste. Keep warm over low heat while carving the chicken. Serve the chicken and vegetables with warm gravy. Oh how gorgeous is this!! I love the crispy skin, the inside must have been so juicy. Looks like it walked out of a magazine. Donna, do try it when you get a chance. It IS juicy, and the skin is perfectly crisped – it’s just delicious. Oh my God, they are PERFECT, all right! I still haven’t mastered the courage to try cooking a whole chicken in my kitchen! Sophia, I encourage you to try it – it’s a LOT easier to roast a chicken then you think. Let me know how it goes!